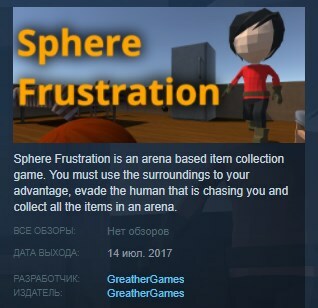 Sphere Frustration is an arena based item collection game. You must use the surroundings to your advantage, evade the human that is chasing you and collect all the items in an arena. In survival mode you progress through a variety of arena´s of increasing difficulty. You only have 1 life, get caught? Game Over. There is also quick game, this allows you to play any arena, selecting your own difficulty level. Play your favourite arena´s or practice for survival mode. Sphere frustration also features multiplayer split screen with keyboard sharing. Go head to head against a friend with an item collection limit, choosing the difficulty level to suit you. Alternatively one player can take control of a collectable item with the other player controlling the sphere.